ANA LJUBINKOVIĆ IS A WOMENSWEAR DESIGNER AND ARTIST BASED IN BELGRADE, SERBIA. SHE GRADUATED FROM THE UNIVERSITY OF BELGRADE IN 2002, WITH A DEGREE IN PAINTING. UPON GRADUATION SHE DECIDED TO BRING TO LIFE HER FASHION SKETCHES, FROM THE COURSE OF STUDIES. HER FIRST COLLECTION WAS SHOWCASED AT BELGRADE FASHION WEEK. SHE CONSIDERED THIS MOMENT AS THE BEGINNING OF THE ANA LJUBINKOVIĆ LABEL. HER ROOTS IN THE VISUAL ARTS ARE STRONGLY EVOCED IN HER DESIGNERS, PUSHING BOUNDERIES IN A THOUGHTFUL BUT WELL-CONCEIVED WAY. THE DOLLS FROM JAN ŠVANKMAJER`S SHORT FILM “JABBERWOCKY” WERE AN IMPORTANT SOURCE OF INSPIRATION FOR ANA WHEN CREATING HER SS17 COLLECTION ALONG WITH GEORGES MÉLIÈS "THE IMPOSSIBLE VOYAGES" AND WILHELM REICH`S CLOUDBUSTER MACHINES. CREATING AN ASTONISHING COLLECTION, STIFF BUT GIRLISH, UNIFORM-LIKE SILHOUETTES IN PASTEL COLOURS, WITH A CARTOON LIKE SENSIBILITY. THE CLASHING OF SHARP AGAINST SOFT LINES AND THE COMBINATION OF FORMS WITH A GREAT ATTENTION TO DETAILS CREATE A PERFECT HARMONY OF CREATIVE CHAOS, A REOCCURING THEME IN LJUBINKOVIĆ`S WORK. THE DESIGNER HAS ALWAYS BEEN EXPERIMENTAL IN HER USE OF TEXTILES, COLOURS AND FORMS. 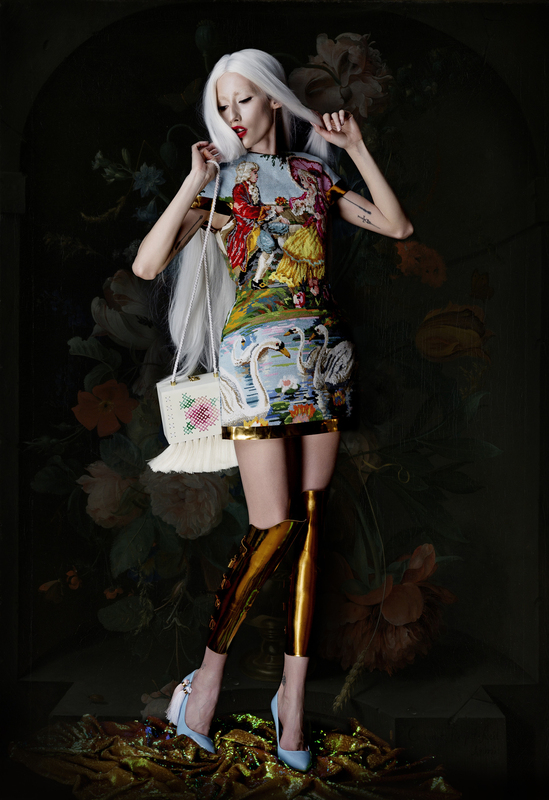 ANA LJUBINKOVIĆ`S COLLECTIONS EMBODIES POSITIVE KITSCH: ITS COLOUR, ITS HUMOUR, ITS PLAY. THERE IS ALWAYS A CENTRAL STORY, BUT IT`S NEVER CLEAR WHERE THAT STORY MAY TAKE YOU. THE IMAGES SHE PRODUCES ARE WEIRD, CHALLENGING AND BEWILDERING – UNTIL YOUR EYES ADJUST TO WHAT YOU ARE TAKING IN. FOR A MOMENT, IT TURNS STICKY SWEET, BUT THEN IT HITS YOU - LJUBINKOVIĆ`S PIECES CONJURE A MOOD, AN ATMOSPHERE OF WHAT A PERFECT, DREAMLIKE WORLD SHOULD BE. ANA WAS ONE OF THIS SEASONS FASHION SCOUT SS17 ONES TO WATCH AWARD WINNERS. SELECTED FROM A LONG LIST OF EMERGING DESIGNERS BY A PANEL OF INDUSTRY EXPERTS WHICH THIS SEASON INCLUDED MARTYN ROBERTS, FASHION SCOUT’S FOUNDER AND DIRECTOR, ESTEEMED FASHION WRITER TONY GLENVILLE, ONES TO WATCH’S VERY OWN STYLIST, REBEKAH ROY AND KENDALL ROBBINS, FROM THE BRITISH COUNCIL. FASHION SCOUT’S ONES TO WATCH PROVIDES A UNIQUE PLATFORM FOR THE BRIGHTEST NEW DESIGNERS, WITH MANY GOING ON TO BECOME ESTABLISHED LABELS IN THE INTERNATIONAL FASHION INDUSTRY. FASHION SCOUT FOUNDER AND DIRECTOR MARTYN ROBERTS COMMENTED ON THIS SEASON’S SELECTION: “THE ONES TO WATCH SHOW IS THE PERFECT LAUNCH PAD FOR TALENTED NEW DESIGNERS. THIS SEASON’S FOUR DESIGNERS PRESENT COMPLETELY DIFFERENT VISIONS OF THE FUTURE OF FASHION. THIS IS THE SUCCESS OF ONES TO WATCH AND WHY IT IS SO POPULAR.” THE ONES TO WATCH DESIGNERS WILL PRESENT THEIR NEW COLLECTIONS IN A CATWALK SHOWCASE AS WELL AS BEING PART OF THE FASHION SCOUT LONDON EXHIBITION DURING LONDON FASHION WEEK. ONES TO WATCH IS DESIGNED TO SUPPORT EMERGING DESIGNERS, DEVELOP BUSINESS INTERNATIONALLY AND GENERATE MAXIMUM MEDIA AND BUYER ATTENDANCE.